Bill C-51, Canada’s controversial anti-terrorism legislation, received royal assent in late June 2015. The Bill is wide in scope, but has a number of important ramifications concerning the personal information of Canadian citizens. For example, according to Bill C-51, personal information, including health information, can now easily be shared among a multitude of government agencies. As a result, a number of experts have argued that Bill C-51 infringes both on the privacy and security of personal information. In this book, Glenn Greenwald delves into the specifics of the documents leaked by Edward Snowden, focusing heavily on the implications of government surveillance on individual privacy. The book also outlines how Greenwald came into contact with Snowden in the first place. This is a fascinating, yet disturbing read! Black Code argues that we are giving up more and more crucial data to government agencies and corporations without considering the implications. As we do so, the Internet is becoming both more unsafe to the average user and less democratic. Author, Ronald Deibert, puts forward some possible solutions to the current problems of cyber-security. Bruce Schneier makes some valuable suggestions as to how surveillance and data gathering by corporations and governments can be reformed. He argues that such reforms can both maintain national security and promote individual privacy. This book focuses specifically on the issue of surveillance in Canada. It identifies and explores 9 key trends in the collection and use of the personal data of Canadian citizens. 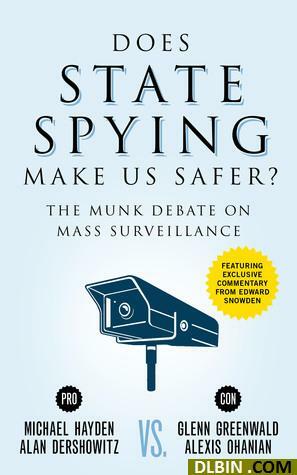 Among other things, the authors of this book claim that surveillance of citizens is rapidly increasing in Canada. Does state spying make us safer? : the Munk debate on mass surveillance / Michael Hayden, Alan Dershowitz, Glenn Greenwald, Alexis Ohanian ; edited by Rudyard Griffiths. This debate by 4 experts provides a balanced and insightful overview of the pros and cons of government surveillance. If you’re undecided about where you stand when it comes to the privacy of your personal information, this is a good place to start!